A rendering has been revealed of the 11-story, 181-affordable-unit mixed-use building planned at 4511 Third Avenue, in the Belmont section of the Bronx. The 294,207-square-foot, thru-block development (consisting of seven- and 11-story components), will host 57,549 square feet of medical space on the ground and second floors and 10,127 square feet of ground-floor retail, as YIMBY reported in February. The rental apartments above, all of which will rent at below-market rates, should average 928 square feet apiece. Amenities include a 128-car garage, storage for 96 bikes, laundry facilities, and multiple outdoor terraces. The SBH Health System (St. Barnabas Hospital, located across the street) will utilize the medical space, as well as operate a 10,800-square-foot terrace geared towards exercise for the building’s tenants. Locations of 4511 Third Avenue and 4439 Third Avenue. That’s only one portion of the project. The same developers are also planning a 12-story, 133-affordable-unit mixed-use building a block away at 4439 Third Avenue. That building, filed in September of 2015, will encompass 145,952 square feet. It will contain 11,411 square feet on the ground floor for a daycare center. All of the rental apartments above, averaging 954 square feet apiece, will rent at below-market rates. And amenities include laundry facilities, a community room, bike storage, and an outdoor recreation space on the second floor. Across both buildings, a total of 95 apartments will be designated to formerly homeless people. L+M Development Partners, Hornig Capital Partners, SBH Health Systems, along with the city’s Department of Housing Preservation and Development (HPD) and the state’s Homes and Community Renewal, are the developers. Dattner Architects is behind the design. Construction permits have been issued, and the developer hopes for completion by late 2018. 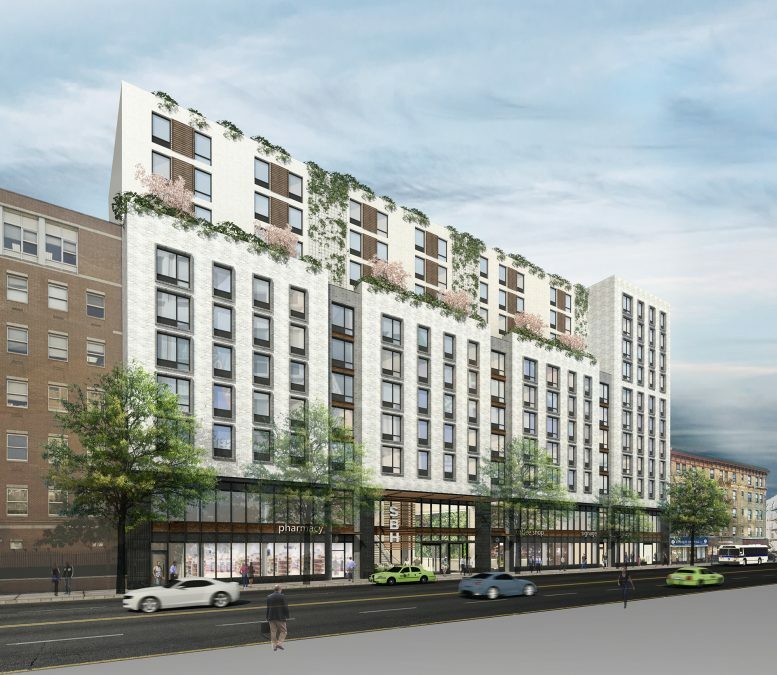 5 Comments on "Reveal for 11-Story, 181-Affordable-Unit Mixed-Use Building at 4511 Third Avenue, Belmont"
Good morning YIMBY..romantic building on top of flowers, concrete and greenery are suitable. I’m sorry – but unless you are a senior who absolutely needs one – cars in NYC for “affordable housing” is an oxymoron. If you can afford a car then you shouldn’t qualify. Same for “public housing”. All this does is exacerbate the problem with these “lotteries”. Tax dollars should not subsidize people to be able to own cars. A 128-car garage is excess. I guess this location was removed from the MIZ parking minimum elimination area. Why are you automatically assuming that the parking is for the residents? 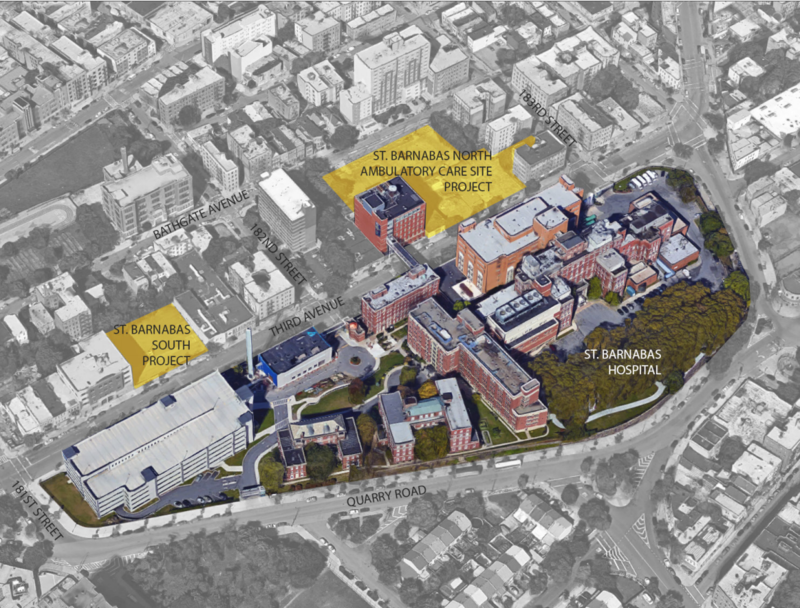 St Barnabas Hospital is across the street and they also seem to have space in the new building. How would someone apply for these apartments?